Bernard McCullagh of Ireland won the main Open Men event at the first Qatari Diar Triathlon hosted at Lusail City. McCullagh clinched the top place with a time of 54 minutes 11 seconds in front of Aday Alvarez of Spain and Mouhcine Rhaili Morocco. With this victory McCullagh also came on top of the Series standings. Over 250 adults and kids tpook part in the event at the Lusail City. Marina Promenade, next to the Yacht Club triathlon which was the main venue and start of the race. Spaniard Isora Sosa Caballero continued with her clean streak of 4 victories out of 4 races with 1h3m2s and is already winner of the Qatar National Triathlon Series. Second place went to Daniela Sposi Great Britian and Gerda Maria Dumitru of Romania came third. In veteran categories Enzo Fascinato (Argentina) 59m23s won in Men’s race in front of Manuel Miceli (Italy) and Jody Sanderson (Canada). Hilda Allin (South Africa) 1h8m55s was the fastest among veteran women in front of Andrea Stadler (Ecuador) and Annemarie Kilshaw (Australia). 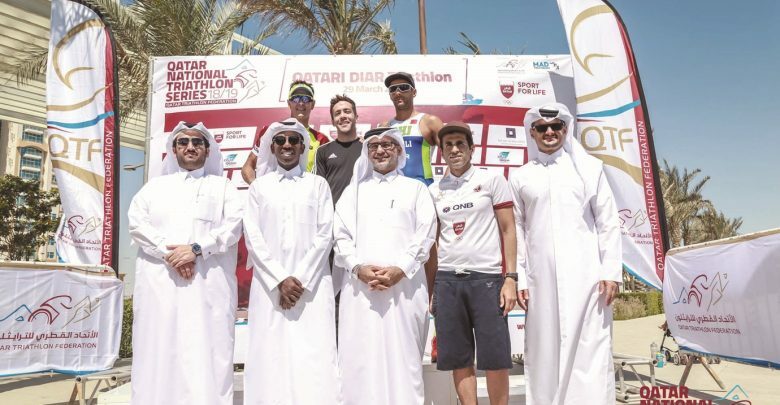 Triathlon is becoming popular among Qataris. Some of them couldn’t participate on this event, since Samla race, which can be looked in some way as an extreme version of triathlon, just finished last weekend and left many athletes too tired to take on the Qatari Diar Triathlon. The best Qatari was Mubarak Alajji 1h5m44s followed by Abdulla Alhemaidi and Abdulrahman Aljaber, who is the leader in the Series. 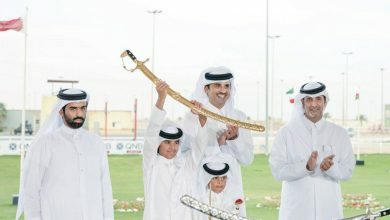 Nasser Almohannadi came on top in Qatari veteran category, Fahad Al Groon was second and Saoud Almarri was third. The same order stands also in the Series, where Almohannadi claimed four victories in four races and can be declared as a winner of this season’s Series. Caroline Van Aatrijk won the Qatari women veteran race and is also already 2018/2019 Series winner. Team relay competition saw a staggering 20 teams taking on the challenge. The fastest time of 57m59s was done by Ismail Dergaa / James Moffat / Adil Adnan Faqruddin. Thani Al Zarra; board member at Qatar Cycling and Triathlon Federation was positive after the event: “Lusail City proved to be one of the best venues for triathlon in Qatar, with prospects of future cooperation between Qatari Diar and Qatar Cycling and Triathlon Federation. The fifth and final event in Qatar National Triathlon Series, “The Pearl Qatar Triathlon”, will happen on April 19. For more information about the Series, results and points standing visit this site. 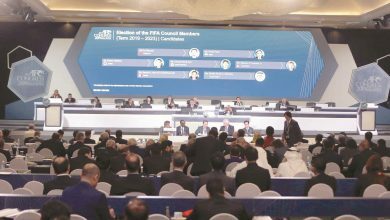 شهدت بطولة ترايثلون الديار القطرية التي استضافتها مدينة لوسيل، يوم الجمعة الماضي، نجاحاً كبيراً في نسختها الأولى؛ حيث شارك أكثر من 250 متسابقاً من مختلف الأعمار، وسط أجواء رائعة بالقرب من نادي اليخوت. وحقق الأيرلندي برنارد ماكولاج الفوز بالفئة المفتوحة، بعد أن أنهى المسابقة في زمن قدره 54 دقيقة و11 ثانية فقطـ، وتصدّر بذلك الترتيب العام لسباقات الترايثلون. ولدى السيدات، واصلت الإسبانية إسورا سوزا كاباليرو سيطرتها وحققت فوزها الرابع على التوالي. وأنهت كاباليرو المسابقة في زمن قدره ساعة و3 دقائق وثانيتين. وفي فئة الرواد، نال الأرجنتيني إنزو فرانسيسكو اللقب بـ 59 دقيقة و23 ثانية، بينما ذهب لقب السيدات للجنوب إفريقية هيلدا آلين (ساعة و8 دقائق و55 ثانية). وشهدت شعبية رياضة الترايثلون ارتفاعاً كبيراً خلال السنوات الأخيرة خاصة بين القطريين، ولكن الكثير منهم لم يستطع المشاركة في ترايثلون الديار القطرية بسبب مشاركتهم قبل فترة وجيزة في سباق صملة، أصعب سباق في الرياضة القطرية. ولكن مبارك العجي كان متواجداً ونجح في تسجيل أفضل زمن للقطريين (ساعة و5 دقائق و44 ثانية)، وتبعه عبدالله الحميدي، ثم عبدالرحمن الجابر الذي يتصدر الترتيب العام في البطولة الوطنية. وفي فئة الرواد للقطريين، حقق ناصر المهندي الفوز للمرة الرابعة هذا الموسم، تلاه فهد الجرون، ثم سعود المري. وفي فئة الرواد القطريات، فازت كارولين فان أريتجك بسباق المرأة القطرية.